is the latest in groundbreaking previz software to make your projects easier and your preproduction faster. StoryBoard Artist version 5 adds greater depth of content with higher speed and functionality. We’ve introduced new features, brought in favorites from Quick and Quick Studio, and multiplied the artwork to make this our most exciting release ever! Be sure to see the demo! The new features of StoryBoard Artist 5 focus on bringing more flexibility to the software, so you can make your storyboards as unique as your ideas! This new version adds more image import options, including 3D SketchUp files and video: browse thousands of free SketchUp files in the online Google Warehouse and import them as props and locations, or choose QuickTime and other video files from your computer and add almost anything to your boards. Effects have been added to alter all graphics—whether imported images or standard Artist artwork—so they can be skewed, colored, blurred, or made transparent for use with other characters, props, or locations in your previs. StoryBoard Artist 5’s artwork has been updated and renovated to give you the best selection of Characters, Props and Locations for your projects. Artist 5 adds adds a whole cast of new 3D rendered characters exclusive to version 5! We’ve also thrown in the best of StoryBoard Quick 6 Studio’s extensive Character and Props—allowing you to colorize your Characters and Props, and save custom Characters on the My Characters palette for future use. StoryBoard Artist 5 not only brings you the content to make your projects unique, but also gives you the flexibility to work the way you want to work! With new, improved Sketch Mode in version 5, you are no longer limited to Print-to-Sketch—you can now work, export, and present in Sketch Mode too to make your storyboards look like you drew them by hand! StoryBoard Artist 5 also has multiplied the types of sketch styles so you can get the look you want (and there are even more available in Artist Studio). Your project is more unique and personalized than ever, and it’s faster too: we’ve brought the shot-generating power of QuickShots technology to build your storyboards lightning fast! The interface has been updated to provide easy access to great new features and now includes new functionality features such as the Layers Palette, smart window sizing, interactive cursors, and more. 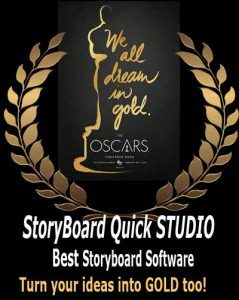 StoryBoard Artist 5 adds more import options for a more streamlined workflow with popular filmmaking software programs, such as Final Draft, Scriptwriter, and Scriptware script-writing programs and EP, Gorilla, and Showbiz scheduling software. New script and scheduling file importing means that Artist 5 gives you an even bigger jumpstart on organizing and planning your storyboards for shooting! The latest version also cross-platform so that you can share your Mac storyboard documents with coworkers and crew who use StoryBoard Artist on Windows (and vice versa)! StoryBoard Artist 5’s flexibility stretches even further, now allowing you to open and edit StoryBoard Quick files for smooth upgrading, collaboration, and organization in your next project. Click here to see more about the NEW StoryBoard Artist version 5!